BAS Vignette: How Do You Say Good-bye? This past June, the Chinook Project returned to Kimmirut, a small community on the southern shore of Baffin Island and the site of our inaugural trip two years ago. Last year, we visited Cambridge Bay in the western Arctic. Marti Hopson wrote about that trip for the September 2007 issue of The Fan Hitch. Her piece describes not only the specifics of the visit to Cambridge Bay, but also the more general and generally applicable aspects of the project itself. The focus of this year's story is slightly different. One of the requirements for the student veterinarians participating in the Chinook Project is that they work with me after the trip to produce short non-fiction pieces about their experience. An incident that occurred this year allows me not only to describe that experience to you, but also to begin with an excerpt from one of the student's completed pieces from that first trip. Balto immediately began to lick his incision. Ordinarily this action would have won him a fancy, plastic Elizabethan collar to wear for the duration of his recovery, but those were in short supply in our Kimmirut clinic, so we dressed him in the next best thing: an oversized beige T-shirt with Inuktitut lettering in blue that (very) roughly translated to 'Our language is important.' His Inuit owner returned as promised, later that afternoon, and I sat down to review the important post-op instructions with him. My spiel went something like this: "Your dog Balto had surgery today to remove his testicles. He won't be able to make any more babies. He may fight less. He has a small incision on his belly, and there are stitches that will dissolve in several weeks. It will take some time for the incision to heal, so it is very important that he is quiet for the next week and a half. You should not allow him to run around or play, because otherwise the incision might open. It is important that the incision stays clean, so he should not sleep in the dirt or mud. The incision should not get wet, so Balto cannot swim for the next week-and-a-half. And he needs to be watched so that he doesn't lick his incision or tear out his stitches. We have put a T-shirt on him to help prevent him from licking. This is very important for his incision to heal. No running, no swimming, no licking!" Balto's owner looked at me, nodded, and then asked if Balto could run along after the four-wheeler to the campsite on the way home from the clinic. A bit startled (after all, my instructions had been so clear! ), I met Balto's owner eye to eye and emphatically stated, "No! No running, no swimming, no licking!" The next morning, as we walked to the clinic to begin the day, I caught a glimpse of beige t-shirt flash by. I exclaimed, "That's Balto!" Sure enough, there, running at breakneck pace through town, was the tall, lean, dirty white, wire-haired mutt with the lopsided grin, still wearing his t-shirt promoting literacy. We decided that we should try to get hold of him and make sure his incision looked okay, especially considering the obvious lack of compliance with post-op instructions. We stopped, and Balto came trotting over. He was only too happy to stand up on his hind feet, with his front paws in Jen's hands as I bent down to look at his underside. Sure enough, his incision was intact. Not only that, it looked great - no swelling, no oozing, no damage whatsoever. In fact, it looked better than most incisions done in fancy hospitals for hundreds of dollars. When we were through examining him, Balto lingered for a moment for a quick pat and then he shot off again. Rachel's piece attests to her amazement at the apparently miraculous recovery and healing powers of Balto, a unique and memorable dog. An experience we had this year in Kimmirut, though, suggests that Balto, although definitely memorable, might not be unique. 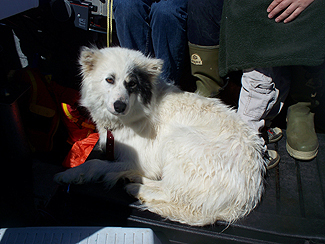 This summer, along with many other dogs, the Chinook Project met Isa, alpha female on our host's sled dog team. Isa's latest litter of puppies, newly weaned, was living in a pen outside our host's house, and each pup was scheduled for neutering while we were there. Isa was also scheduled for surgery, and our host had carefully planned the timings of the six operations so that she could provide space inside her house for each dog to recover away from the dirt, ministrations of other dogs, and, perhaps most serious of all, the gargantuan, vicious, vampiric mosquitoes. Unfortunately, a day of no-shows at the clinic meant that in order not to fall behind in our surgery schedule, we did three of the pups and Isa in the same day. This meant that for that night our host's small house contained our host, her husband, their youngest child, two veterinarians, one project coordinator, one adult female dog and five pups. (Yes, five - no way were the two pups who were yet to face surgery willing to be left outside if their mother and siblings were in.) Needless to say, that night was noisy and very, very poopy. The next day, our host had arranged to take us "out on the land" – boating to see icebergs and then hiking on a local rocky island. Isa wasn't ready to be taken back to the team. She couldn't be left inside, and she certainly couldn't be left outside with the happily recovered pups who seemed to forget they'd been weaned and were pestering Isa with their attempts to nurse. There was only one thing to do - take Isa with us. The plan was to lift her into the back of the truck where she could rest with several of the students, then lift her out at the water, walk her gently to the boat, and lift her in. All went well until we lifted her out of the truck at the water. Our host and her husband walked in one direction to their rowboat which they would use to get them out to the motorboat, which they would then drive over to the point of rock, accessible only at high tide. Meanwhile, the rest of us walked in the opposite direction, carrying the day's supplies and other boating essentials to the point where we were to wait for the boat. Isa would, of course, follow along with us…except that she didn't, and we didn't notice at first. In fact, we didn't notice until we turned around, just in time to see Isa racing over algae-covered rocks on the shore towards the place where the little rowboat had entered the water! We yelled; we jumped up and down; we dropped our supplies and ran towards her, and then we stood stock still, holding our breath, and willing her to turn around and come to us. She didn't. And when she reached the place where the rowboat had left the shore, she leapt gracefully into the air and landed in arctic waters cold enough that they were still dotted with chunks of ice; cold enough that when I put my naked foot in the water later on, my ankle bones sang with the pain. We stood on the shore and stared at Isa, not twenty-four hours out of fairly extensive surgery, paddling with grim determination toward her owners. When, after a brief return to shore to gather strength, she made it to the boat, we watched in horror as her owners frantically tried to turn her around and send her back as there was no way to lift her out of the water and into the boat. Sickly anticipating tragedy, the rest of us scattered ourselves along the shore, yelling, snapping fingers, cooing, whistling, clapping, waving. But it wasn't our encouragement so much as Isa's dejection that finally sent her back to the shore. She arrived, and the students immediately rolled her over to check her incision. It looked fine. Isa, herself, also seemed fine. She had a little nap after we finally managed to lift her into the boat, but she was ready to go on polar bear alert by the time we got to the island. And she stayed ready-to-go throughout the day. As with Balto, she suffered no ill effects from her refusal to consider herself in post-surgical recovery mode. 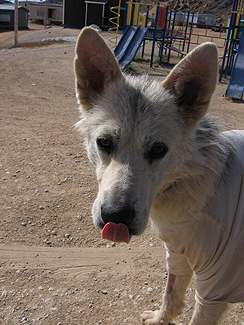 As with Balto, later checks on her surgery site suggested incredible powers of healing. Our two visits to Kimmirut – and especially our encounters with Balto and Isa – have taught us that Inuit Sled Dogs are incredibly tough, stubbornly determined and fiercely loyal. They are also remarkably gentle and endlessly forgiving. While Balto and Isa had spent a lot of time with humans and inside houses, many of the dogs we've tended have never been inside; and several have been victims of abuse and/or neglect. But when they are dragged inside by owners or volunteers, they are neither aggressive nor uncontrollably anxious. They are dignified and trusting. In the three years we've run the Chinook Project, we've only had one dog-bite injury, and that bite was delivered not by an Inuit Sled Dog, but by a small southern import. While Balto and Isa might not be unique within their breed, our northern experiences suggest that their breed is unique among dogs. We have been privileged to be part of this project – a tiny step towards providing these historic dogs with the veterinary care they so need and deserve. The Canadian Animal Assistance Team has also been working in this area, but neither of our groups has the financial resources, human power or time to really make a dent in the northern need. Northern Canada is vast, with tiny communities that rely, to varying degrees, on Inuit Sled Dogs. We will continue to do what we can for as long as we can, and we hope that other groups will hear the call and start their own programs to help these dogs, to help their communities, and to help to preserve life and livelihood in Canada's North. The Chinook Project receives funding from various organizations and individuals, including the Sir James Dunn Animal Welfare Centre at the AVC and First Air. Dr. Jane Magrath teaches English Literature at University of Prince Edward Island. The Chinook Project was inspired by a visit she made to Kimmirut one winter. As well as helping the students with their writing, she has participated as site coordinator and general "dogsbody" during the three northern trips made by the Project. Her ability to help out with MINOR veterinary procedures on the Project is proof that, as she repeatedly tells her students, "You can do ANYTHING with an English degree!"